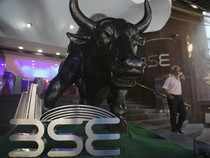 NEW DELHI: The domestic equity benchmark BSE Sensex was trading 71.97 points up at 38,435.44 on account of buying in frontline bluechip counters. Shares of Arambhan Hospitality Services (up 19.98 per cent), Times Guaranty (up 18.35 per cent), CNI Research (up 16.24 per cent), Hisar Metal Industries (up 16.23 per cent), Naysaa Securities (up 15.03 per cent), Oil Country Tub (up 14.53 per cent), Transchem (up 13.63 per cent), Vikas WSP (up 12.58 per cent), Zeal Aqua (up 12.02 per cent) and Pecos Hotels & Pubs (up 11.97 per cent) were among the top performers. Reliance Communications (up 10 per cent) and Indiabulls Real EstateNSE -5.96 % (up 5.64 per cent) too were trading 5-10 per cent higher at around the same time. The Nifty 50 index was trading 10.05 points up at 11,542.45. Among the 50 components in the Nifty index, 24 shares were trading in the green, while 26 were in the red.